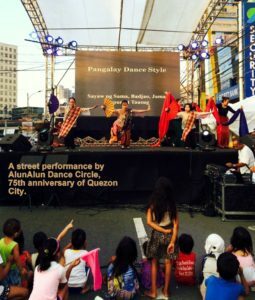 The AlunAlun Dance Circle marked its 15th year since the organization’s legal existence in 2000. Here are 15 things to remember and be thankful for about 2015. For 15 years, ADC members and friends continued the practice of holding dance sessions every Sunday, through sultry or stormy weather. The weekly practice has become a tradition. On 20 and 21 March 2015, the Handog Center was inaugurated with film showings on the first day and performances on the second day. The Handog Center is another home of the AlunAlun Dance Circle based in Marikina City, with address at 9 JP Rizal corner MH del Pilar streets, Calumpang, Marikina City. 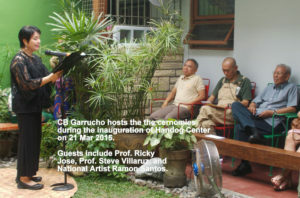 The Handog Center is the present (2016) address and office of the AlunAlun Dance Circle. Early in 2015, we learned that the National Commission for Culture and the Arts (NCCA) approved our proposal to make a Pangalay Handbook or manual to aid in the teaching of pangalay. Completed in 2015 by pangalay guru, Ligaya F. Amilbangsa, it will soon be published by the ADC. The book is finished and will be out in 2016! 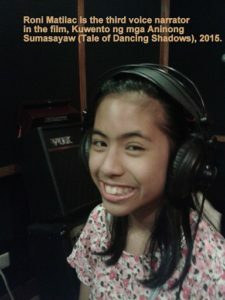 In 2015, children took center stage as the narrators and dancers in a short film entitled Ang Kuwento ng mga Aninong Sumasayaw (A Tale of Dancing Shadows) written and directed by Nannette Matilac with animation by Ellen Ramos. 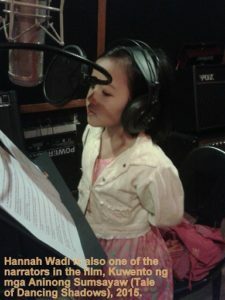 Produced in 2015 with NCCA support, the short film will be launched in 2016. 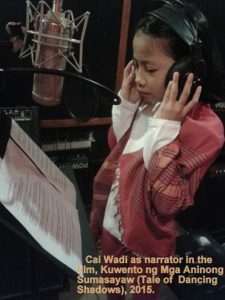 The child dancers/narrators are Cai Wadi, Hannah Wadi, and Roni Matilac. 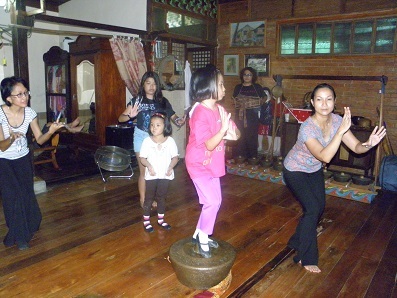 In a few years, these children will grow into lovely ladies dancing pangalay! 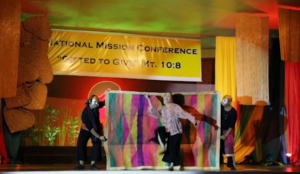 On 20 May 2015, the ADC presented a series of traditional and innovative choreographies for the National Mission Conference with the theme “Gifted to Give.” The performance was held at the Divine Word Seminary in Tagaytay City. The appreciative audience was composed of local and international delegates from the church sector. In the accompanying photo, Nannette Matilac dances the tariray using bamboo clappers with the beautiful mat from Tawi-Tawi as background, held by masked dancers. The well-deserved award for Ms. Ligaya Amilbangsa, ADC artistic director, is recognition of her quiet and continuous efforts in preserving intangible cultural heritage. This iconic photo is by Isa Lorenzo. On 28 September 2015, Marikina City hosted a dinner-tribute for Ligaya Amilbangsa at the Marikina City Cultural Center aka Kapitan Moy heritage house. Ligaya was given the honor as one of the city’s most outstanding citizens. 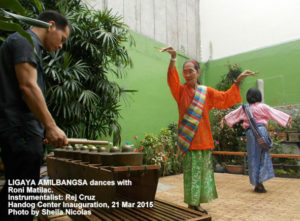 The AlunAlun Dance Circle presented a spunky pangalay choreography using music of the Beatles and Michael Jackson – two artists who were unknown to Ligaya because she was so immersed in Sulu culture for decades. On a sultry afternoon on 10 October 2015, the ADC presented a dazzling 20-minute open air performance. This was on the occasion of the 75 th Anniversary of the founding of Quezon City. The performance preceded the street dancing competition. 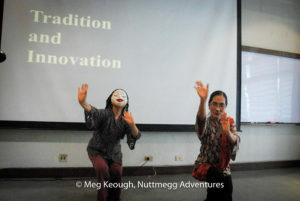 On 14 October 2015, the ADC led by Ligaya Amilbangsa conducted a lecture with dance demonstration for the members of the Museum Volunteers of the Philippines (MVP) for their Philippine history course. The lecture demo was held at the amphitheater of the Ateneo Professional Schools, Rockwell Center, Makati City. The activity signaled the start of a fruitful relationship with the MVP in 2016. 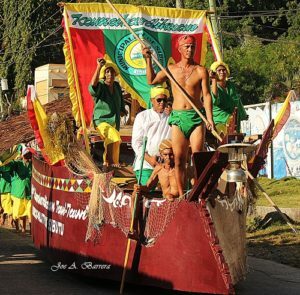 The ADC has always supported preservation and development of tangible and intangible cultural heritage, especially those of the indigenous peoples. On 25 October 2015, the ADC participated in the Likhang Habi bazaar that showcased traditional weaving and fabrics of the Philippines. A short repertoire of pangalay choreographies at the open theater of the Glorietta 2 Ayala Malls included an interpretation of Norma Liongoren’s poem by Ligaya Amilbangsa. Norma has always been a close friend of the ADC since its inception. 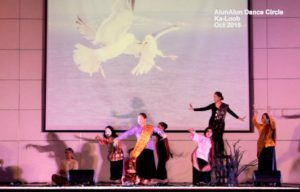 On 28 October 2015, the ADC performed for the benefit of the Lumad youth of Mindanao. Dubbed as Ka-Loob, the benefit concert to support the Lumad youth was held at the GT-Toyota Asian Center Auditorium. The live kulintangan accompaniment of ADC’s performance was rendered by the members of UP Tugma from the UP College of Music. 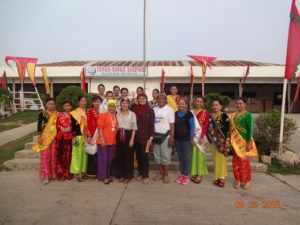 In less than two months after the Agal-Agal Festival in 2015, Ligaya Amilbangsa and Louanne Calipayan were back to Tawi-Tawi, this time for the 1 st Sama Dilaut (Philippine Badjaw) International Conference held in Tawi-Tawi on 1-3 December 2015. Of course, Ligaya Amilbangsa’s participation was important. 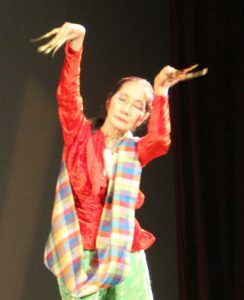 She was the first to document Sama Dilaut ritual dances in early 1970s, bringing them to the legitimate stage at the Cultural Center of the Philippines. Ligaya delivered the paper entitled: “Negotiation and Accommodation of Igal as Aesthetic and Performative Ritual.” The first conference on the Badjaw in the province was held at MSU-Tawitawi College of Technology and Oceanography. We thank our friends and co-advocates who work for the preservation of traditional cultural heritage. 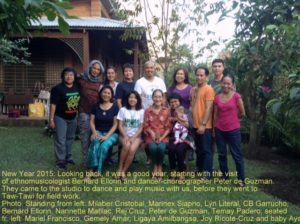 We thank the print, broadcast, and online media coverage in 2015 that helped in disseminating information about what the AlunAlun Dance Circle is doing to preserve pangalay (aka igal or pansak) and related arts of Southern Philippines.